Welcome to the next installment of a weekly segment where we dive into one Elder Scrolls Online’s many Sets, and explore what sort of Builds you can make. Not only will we show you how to get the most from these Sets, but we’ll explain where to get them, what requirements there are to obtain them (if any), and everything else you could possibly want to know about them. This week’s Set is a Crafted Set that was added with the recent Clockwork City expansion this past month: Fortified Brass. An example of some Medium Armor. You can see the 5 piece bonus is a huge amount of Resistances! Fortified Brass was introduced with the addition of the Clockwork City DLC (Update 16) in October/November of 2017. This Set can currently be acquired via Crafting inside the Restricted Brassworks within The Brass Fortress of the The Clockwork City. This zone requires the purchase of the DLC or a ESO Plus membership. This Set is bind-on-equip, so it is also possible to purchase it from Guild Vendors or trade with other players who have pieces. Fortified Brass requires 4 Traits researched in order to craft each specific piece, and since it is crafted it doesn’t have Jewelry. As with all other Crafted Sets, you can make it in any Style that you currently know, giving it a wide variety of appearances. This Set requires 4 Traits researched for each piece you want to make: Weapons, Armor or Shields. This Set provides a total of 8145 extra Physical and Spell Resistance at Legendary Quality at Champion Rank 160. Below are the Armor values of the different Armor types made of this Set. 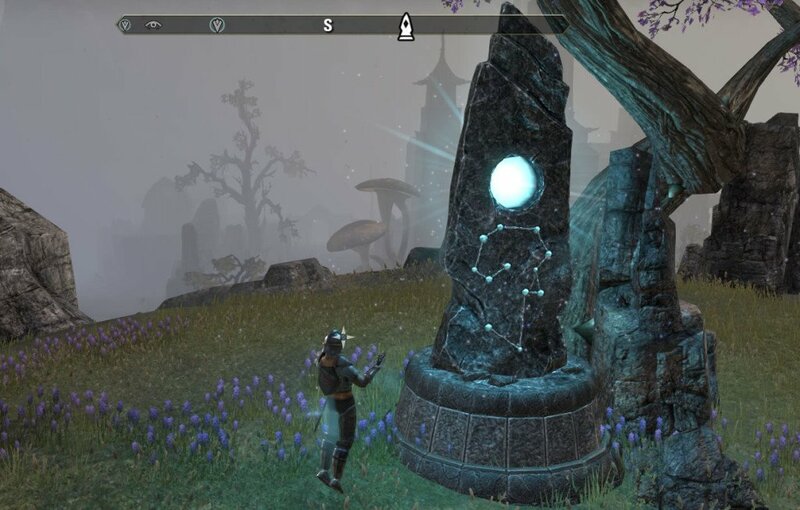 In Elder Scrolls Online players have two types of Resistances: Physical and Spell. Inside each are sub-types. Physical includes Poison and Disease and Spell includes Frost, Shock and Fire. At 33,100 Physical or Spell Resistance (662 = 1%), players reach a cap of 50% mitigation and they cannot mitigate any additional damage done with Resistances. For the purposes of calculation, specific Resistance to Shock, Frost, Poison etc, are simply added to your Physical or Spell Resistance when taking damage of that type. If that number would take you over the 33,100 threshold then you would NOT receive any additional Resistance. However, this does not factor in any sort of Penetration used by the enemy. In PvP, many players will have between 5000-15000 Penetration, which will subtract directly from your Resistance. In this case having higher than 33,100 Resistance will actually mitigate damage and you would need somewhere over 45k Resistance to ensure you never took more than 50% damage. Let’s do an example: If you have 40,000 Spell Resistance and a player with 10,000 Spell Penetration attacks you, you will have an effective Spell Resistance of 30,000 vs their attacks. If you had only 33,100 Spell Resistance when they were attacking you, you’d only have 23,100 Spell Resistance vs their attacks. In this case, having above the 50% threshold is actually useful and encouraged. Critical Resistance operates a bit differently and comes into play when someone scores a Critical Strike against you. Since enemies in PvE cannot Critically Strike, this is only necessary for those who PvP. Every 68 = 1% Critical Resistance. Players come with a default Critical Multiplier of 1.5x damage when they strike you. This means, in order to completely negate the extra damage that a default player does to you from a Critical Strike, you would need 3400 Critical Resistance. Most players will have somewhere between 1.6x and 1.8x Critical Multipliers. So, in order to make sure you almost never take any additional damage you would need somewhere around 4550 Critical Resistance. This gives you roughly 60% damage mitigation. Not as high as you thought? That’s because damage mitigation is multiplicative and that means that each source of protection is only giving a percentage of a percentage. The more percentages you add, the less useful each becomes. Think about it like a pie. If you have 50% resistances then that means you have half a pie left. If then you have Major Protection (30%) damage reduction, then you’re taking 30% of the remaining half of the pie which as not as good as if you took 30% of the whole pie. It is done this way to prevent a player from reaching the point they are simply immune to damage, which would be game breaking. Also remember that you gain a 50% damage reduction while in PvP, so be sure to factor that into your calculations. 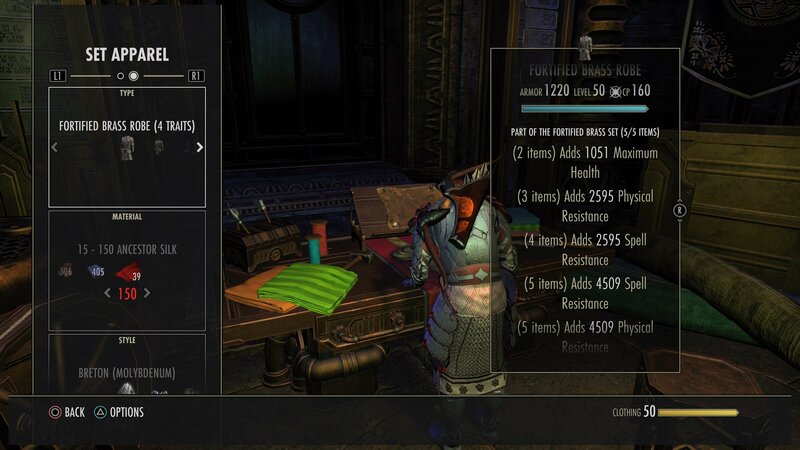 For more information on damage mitigation and calculations, please see this thread on the ESO Forum. It was posted by a user named Paulsimonps and it has a ton of information and is the source of this section. 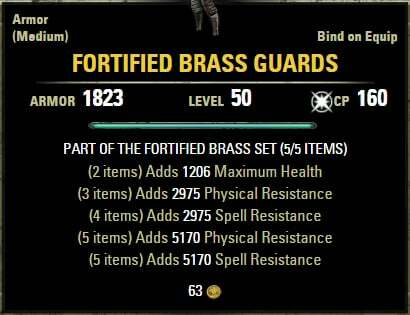 The reason Fortified Brass is such an intriguing Set is that it allows a player to have roughly the same Physical and Spell Resistance as that of a player in Heavy Armor, but instead in Medium or Light Armor. Why is that useful? Well for starters you can actually Tank in Medium Armor if you wanted and second, it allows PvP players to have the surviveability of Heavy Armor, like they did before the Morrowind update, but have the passives of Light or Medium Armor. The biggest drawback to Heavy Armor in Cyrodiil is that it reduces your damage considerably. However, if you can wear Light Armor and still get the 4884 penetration and 10% Critical Chance, you’ll be doing a lot more damage, with roughly the same Armor values. Keep in mind you will also get the cost reduction passives as well as the recovery passives, allowing for better resource management. Light Armor passives can be much better for PvP players than Heavy Armor, while enjoying the same level of protection. Any PvE player wearing this Set is going to be in the Tank role. Tanks using this Set will want to use a Medium Armor or Heavy Armor version. Heavy Armor users will be just over or near the mitigation cap, so will want to be sure to use a 5 Heavy, 1 Medium and 1 Light setup to get the most resources they can while not wasting any Armor. They will also not need the Defending Trait on their 1h Weapon, so they should instead take something else like Powered or Decisive. PvE players Tanking in the Medium Armor version will have less Resistances, but will also have more damage. Seasoned Tanks who know the Dungeons or Trials they will be running should consider running this variant because they can improve group DPS if they are confident they can stay alive. 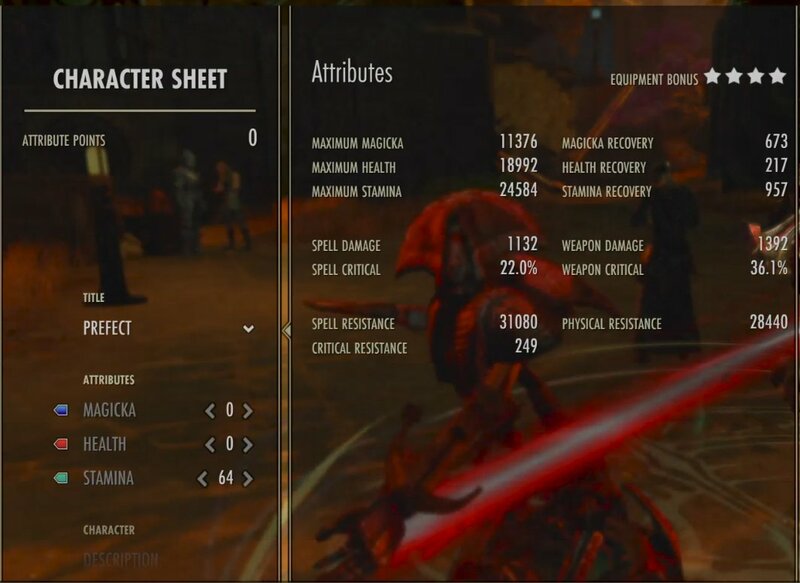 Having access to the Medium Armor passives will not only increase Stamina Recovery and cost, but also increase Weapon Damage and Weapon Critical. Keep in mind that Stamina Cost reduction from Medium Armor does NOT reduce Block Cost. Tanks using it should shoot for 2 Heavy pieces and 5 Medium to try to push their Resistances as close to cap as possible. They should also look for Max Health on their second Set, as they will have a bit on the low end if they use Medium Armor. Medium Armor (7 pieces) = 19344 (Armor) + 3536 (Shield) + 5280 (Major Ward/Major Resolve) + 1376 (Defensive Trait) = 29536 Resistances. My stats with 6 Medium and 1 Heavy pieces equipped. You can see my resistances are quite good, but my health is a bit on the low side (understatement). 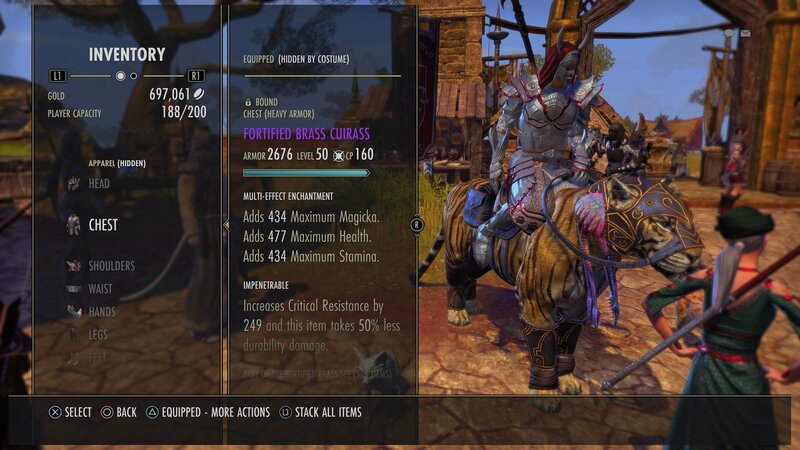 Both Light and Medium Armor users in Cyrodiil or Battlegrounds can benefit from Fortified Brass. You will sacrifice damage for sure by using it, but it will make you much tankier, while at the same time allowing you to have the passives of your preferred Armor Skill line. Sometimes, being able to take more damage is the difference between living or dying, so this can be a great choice (especially for new players). PvP players will need to make sure that they use an offensive Set to compliment this one or they will have serious issues with damage. 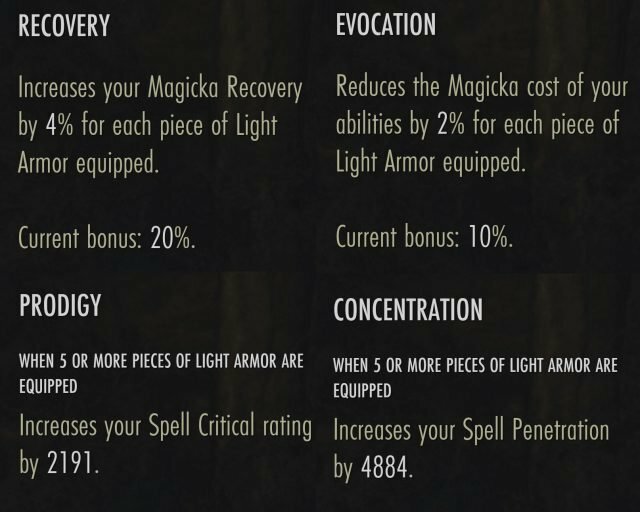 Magicka players should consider something like: Burning Spellweave, Necropotence, Spinner’s Garments, or War Maiden. Stamina players should consider using Bone Pirate’s Tatters, Draugr Hulk, Spriggan’s Thorns or Agility and a Maelstrom/Master/Asylum weapon. 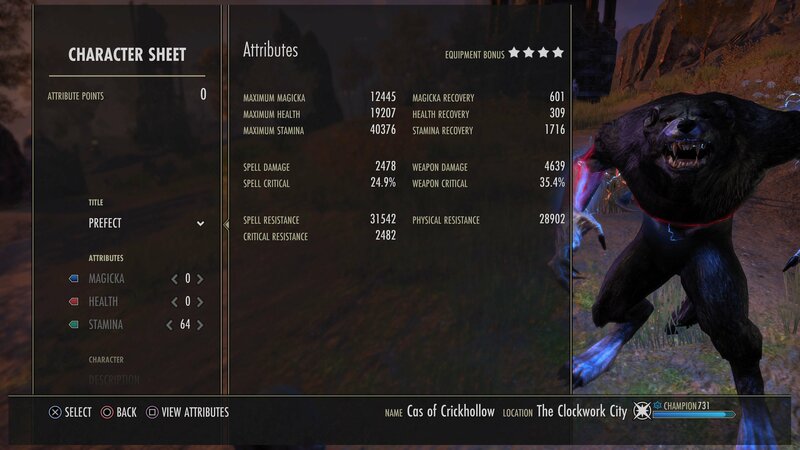 Crazy Resistances, 40k stamina and 4600 Weapon Damage (not in Cyrodiil). If you’re going to be using this Set in PvE or PvP, I highly recommend Medium or Light Armor. This is an “outside the box” Set, and one that really rewards intuitive thinking. Play around with the medium version on your Tank and see how much damage you can crank out, while still being able to hold aggro like a beast. Play around with the Light Armor version in Cyrodiil and see how tanky you can be while still dealing respectable damage. This is the Set for the “balanced” player. I really like to use Prismatic Glyphs on the larger Armor pieces (Head, Chest and Legs) because you need the extra health. Whether you’re tanking or in Cyrodiil, if you’re not in Heavy Armor, you will be low on Health, so be sure to use Food that provides some and be sure to put as much onto your Armor as you need to not die in a few hits. When I tank with this in Medium I use Prismatic and Health Glyphs only. This gets me up to that 30k mark most Tanks should be at. Prismatic Glyphs on my Chest, Legs and Helm, help in PvP for the extra Health and Stamina. Like most defensive Sets, you can backbar this one with a Sword and Shield, so that you have the Resitances when you need them most and you can front bar something else like Willpower or Agility to get extra damage when playing offensively. This is a more advanced style of play, but can help increase your damage. Play around with it and see what you like.